In this wine more than any other art, science & nature collide! River mists, offer humidity, day time sunshine’s heat and drying power create weather that can offer the perfect conditions for Botrytis, and, the eye of the pickers select only the best grapes. In 1993, Château d’Yquem [dee-kem] celebrated 400 years of ownership by the same family. In 1593, the Sauvage family bought this estate which came into the Lur Saluces patrimony when Francoise Joséphine de Sauvage married Count Louis Amédée de Lur Saluces in 1785. Marquis Bertrand de Lur Saluces was one of the 20th century’s most important personalities in the world of wine. Count Alexandre de Lur Saluces has followed in his Uncle Betrand’s footsteps since 1968. Highly motivated to perfect this prestigious product while respecting tradition, he is determined to offer maximum quality. Uncommonly rich and fresh, the wines of Château d’Yquem can be enjoyed either young or old. Young vintages of Yquem are best enjoyed on the cool side (9°C), while it is preferable to serve older ones at a higher temperature (12°C). 燎閭The Sauternes is enjoyed throughout the meal in Bordeaux. One of the more common dishes to serve it with is Foie Gras at the beginning of a meal. Yquem’s powerful aromas and flavours go together with blue cheeses or an old Comté. To take off, you might wish to try quail, duck, or other poultry. You won’t regret the trip. Sauternes can be incredibly long-lived. Bottles of Yquem from before the turn of the last century are still drinking well. In 1790, Thomas Jefferson ordered thirty dozen bottles of Yquem for George Washington and himself. Sweet and unctuous but delightfully charming, the finest Sauternes typically express flavours of exotic dried tropical fruit, candied apricot, dried citrus peel, honey or ginger and a zesty beam of acidity. Sémillon, Sauvignon Blanc, Sauvignon Gris and Muscadelle are the grapes of Sauternes. But Sémillon’s susceptibility to the requisite noble rot makes it the main variety and contributor to what makes Sauternes so unique. As a result, most Sauternes estates are planted to about 80% Sémillon. Sauvignon is prized for its balancing acidity and Muscadelle adds aromatic complexity to the blend with Sémillon. Château d’Yquem is renowned for its absolute mastery of selective harvesting in waves. This technique is dictated by the gradual development of Botrytis cinerea, also known as “noble rot”. The fungus colonizes the grape and causes water to evaporate through the skin of the fruit. This change of state is widely feared, but can transform the grapes into “drops of gold” given the right climate conditions. With the effects of noble rot, the sugar and juice of the grapes become highly concentrated, well beyond ordinary ripeness. The sugar levels inside the grapes become more concentrated, far in excess of normal ripening: 18-30° potential alcohol, i.e. 300-600 grams of sugar per litre! 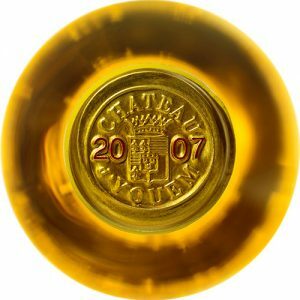 Château d’Yquem’s goal is to obtain musts with 20° of potential alcohol for the must, with 360 grams of sugar per liter. Pickers must ensure that the fruit is at the correct stage of Botrytis development, and on average they carry out 5 or 6 selections over six weeks. This risky process involves a long wait, with late and extended harvests as well as a high risk of losing the crop as winter approaches, and a reduction of around 50% of the total juice volume. As a result, yields are very low at Yquem, on average 9 hectoliters per hectare, and is one of the reasons for its consistently outstanding quality. It takes one vine to produce one glass of Yquem. Grapes have been harvested the same way at Château d’Yquem for centuries. At vintage time, the château’s work force increases by 200 pickers, divided into four groups. They scour the entire vineyard for grapes that are both botrytised and have attained maximum concentration. Harvesting at Yquem calls for picking in several passes. Botrytis cinerea behaves differently depending on the plot, the bunch of grapes and even individual berries. Pickers select only the ripest, most “rotten” fruit. Any grapes that fall short of these criteria are left for the next pass. There are an average of five or six passes per vintage, spread over six weeks. However, in certain years, when the harvest starts in October and does not end until December, it is necessary to go through the vineyard more than 10 times – despite the risk that the vintage may not be worthy of the Yquem name. It takes no more than one hour for grapes picked at Château d’Yquem to arrive at the cellar. Pressing takes into account the texture and fragility of the fruit. The grapes are pressed three or four times at Yquem. As opposed to other white wines, the sugar content and quality increase with each pressing. The first pressing in a pneumatic winepress produces 75% of the total juice, with about 19° potential alcohol. The second yields 15% of the total juice, with about 21° potential alcohol, while the third can reach up to 25°. The hard cake of pomace is then broken up, destemmed, and put through a low-capacity vertical press. If the harvest is very small, we use these same vertical presses exclusively, without recourse to pneumatic presses. Wines from the various pressings are blended before barrel fermentation. Yquem is usually 75-80% Sémillon overing richness, full flavours, and, oppulence. The remain 20-25% Sauvignon Blanc adding acid, freshness, and, vibrancy. A similar blend to the Dry White No.1 table wine from Yarra Yering. Unusually in Sauternes, fermentation at Yquem takes place in barrel to maintain maximum control over this most delicate and mysterious part of winemaking. Only new barrels are used each year. These are made with the finest stave oak from forests in the eastern part of central France. Each individual barrel is closely monitored, and the château’s in-house laboratory carries out regular analyses. The most active musts finish fermenting in just two weeks. However, others can take up to six weeks. Fermentation stops naturally in all instances. The alcohol content at Château d’Yquem varies from 12.5° to 14.5° according to the sugar content of the must. The ideal figure is 13.5° with 120 to 150 g/l of g/l of residual sugar. Wine made from grapes picked on the same day is aged separately for six to eight months. A preliminary blend is made from selected batches in the spring following the harvest. After taste tests and laboratory analyses, wines not up to the château’s strict standards are set aside. The barrels that have been retained are then moved to the ageing cellar where they will stay for twenty months. Every barrel is topped up twice a week. This consists of adding wine to fill up the airspace created by evaporation at the top of the barrel. Furthermore, every barrel is racked fifteen times to remove heavy lees. Light sediment in suspension is removed by a process called fining. The rigorous selection process continues in the cellar. Towards the end of barrel ageing, a rigorous selection takes place at blind tastings. This will determine the final blend of Château d’Yquem. semi-sweet white wine appellations (Sainte Croix du Mont, Loupiac, Cérons, Cadillac, and Barsac) are located. The fact that all of Sauternes’ great growths (eleven first growths and twelve seconds) are located around Château d’Yquem – the only Premier Cru Supérieur – tends to bear out Yquem’s ideal location. Go full screen on the map below and zoom into Sauternes the winery names will pop up and you’ll get a great satellite view of the Château. With its rich botrytis character, this combines impact with delicacy. Clear citrus on the nose with a hint of flint and smoke, allowing the soft white flowers and lime blossom to steal up on you. There are caramel notes through the mid-palate and great persistency-extremely elegant. The final yield is 20 hl/ha, the highest in recent years, with 40 % going into the grand vin compared to 50% last year.75% Sémillon and 25% Sauvignon Blanc. The 2015 will be released in September 2017. Drink 2025-2050.
missing that nerve, the labyrinthe complexity that can mark a top-tier Yquem even at this premature stage, I suspect that this will drink earlier than others, but age in a style only it knows. Yquem. The fruit is lush and honeyed and while all of the lemon and honey notes line up in perfect harmony it is the monstrous acidity and sheer size of this wine which make it so arresting. orange marmalade, exotic flowers and spice all blossom in the glass. There is a real sense of phenolic richness and overall viscosity to the 2016 that adds to the wine's singular personality. The 135 grams of residual sugar are not especially evident. In 2016, the vineyard was harvested in four passes, but it was not until after the October rains that noble rot started to appear on the vine. Deep gold. Fragrant and luscious. Round and dried fruits. Real lift on the nose but massive depth too. This is definitely the cream of the 2016 Sauternes crop! About 75% Sémillon and 25% Sauvignon Blanc. Very pure, intense aromas and flavours of peach, lemon curd, tangerine and marmalade botrytis notes. Boasts 144g/l sugar and 6.2 g/l total acidity. A vintage with picture perfect weather up until the last day of picking on the 19th of October. The grapes were bursting with absolutely ripe, tremendously sweet fruit and blessed with providential botrytisation thanks to warm, rainy weather… The vintage had a rhythm reminiscent of 1989, the opulence of 1990, the intensity of 2003, and the concentration of 2001 and 1893 put together – which makes it a true masterpiece. Served from an ex-chateau bottle. 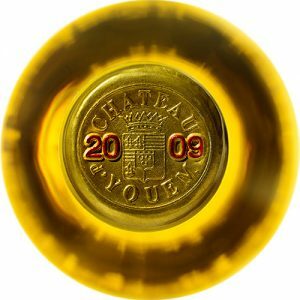 The 2009 Chateau d’Yquem is one showstopper of a wine and perhaps it is only in a vertical that you realize this is up there among the legendary wines of the past – the 2001 included. It has a wonderful nose that expresses the Semillon component majestically: heady aromas of lemon curd, nectarine, jasmine and honeysuckle that all gain momentum in the glass. The oak is supremely well-integrated. The palate is extremely well-balanced with an unctuous entry. You are immediately knocked sideways by the palpable weight and volume in the mouth, which is almost “bulbous,” with layer upon layer of heavily botrytized fruit. It builds to a spicy finish with hints of marzipan and pralines in the background that lend it an untrammeled sense of exoticism. The 2009 is utterly fabulous and decadent, a star that will blaze brightly and undimmed for many years. Drink now-2060+. Tasted March 2014. 98-100 Barrel sample. The aromas are so rich and powerful, with great ripe apricots. There are honey, spice and beautiful sweet spiced pears. This is an extraordinary wine in an extraordinary year in Sauternes. The length to this is exceptional with an intensity yet subtlety. Full and medium sweet with bright and exciting acidity. It's all in balance here. Creme brulee, pineapple, and papaya. Lasts so long on finish. It's so fabulous now. It will age forever but it's already a joy to taste, even drink. Better in 2020. The aromas are closed today, but the core is loaded with apricot, nectarine and orange notes, bolted by a citrus zest spine and backed by toasted almond and piecrust accents on the finish. A large-scale Yquem that shows the richness of the vintage.—Non-blind Yquem vertical (July 2014). Best from 2020 through 2050. Tasted single blind against its peers. Under blind conditions, the Yquem 2007 shines like a diamond. Nevertheless, it is initially rather taciturn on the nose, eventually opening up beautifully with touches of lemon curd, Mirabelle, and clear honey. The palate is medium-bodied with very fine definition and there seems to be a great deal of energy and vigor dispensed for your pleasure. There is such race and nervosity, and then that finish just purrs with harmony and focus. This Yquem feels just so alive and vivacious, yet there is an effortless quality here that is unmatched by its peers. This has really started to put on weight, with heather and ginger notes emerging from the core of dried pineapple, bergamot, candied grapefruit rind and mango. Long and creamy through the very rich, spicy finish, with lingering golden raisin and frangipane notes. Loads of power in reserve, as this sports the bold, hedonistic profile of the vintage in spades. Best from 2020 through 2050. In light of the extremes of weather from one end of the growing season to the other, this vintage alone suffices to illustrate the dexterity, responsiveness, and expertise of the Yquem team. Overcoming the effects of poor weather (said to be unsurmountable by some…), they coped perfectly with harvesting each plot at the optimum moment. Discovering Chateau d’Yquem starts with the bouquet. Although not always very outgoing in young vintages, it is marked by fruit (apricot, mandarin, and occasionally tropical fruit) and oak (vanilla and toast aromas). Older vintages, on the other hand, have an extradordinarily complex fragrance as soon as the bottle is opened.The bouquet is amazingly subtle, with hints of dried fruit (dried apricot, prune, stewed fruit, and marmalade), spice (cinnamon, saffron, and liquorice), and even flowers (linden blosson, etc). The first impression of Chateau d’Yquem on the palate is always silky, and often sumptuous. It then fills out, “coating the palate”. This wine has a strong, but never overbearing character, with great elegance and poise. It always maintains a balance between sugar and acidity (sweetness and freshness). While no surprise here, this wine, which will be bottled in 2009, is certainly this estate's greatest effort since their 2001. It completely outclasses everything from the appellation, but even when you're number one, that's often hard to do. This light gold wine offers up a sensational smorgasbord of aromas including huge honeyed pineapple and other caramelized tropical fruit flavors, massive richness, and a viscous, unctuous texture with the oak beautifully integrated. The wine has enough acidity to buttress its full-bodied mouthfeel, but this is not by any means the sweetest or most alcoholic of the d’Yquems I have tasted. In fact, in the range of d’Yquems, this is a powerful wine, but it is one built more on finesse and elegance, a la the 1988. Nevertheless, this wine will prove to have 50+ years of longevity. The finish, the mid-palate, the sensation of looking at a skyscraper of Semillon with a small dosage of Sauvignon, is impressive. Like all of the sweet wines of Barsac and Sauternes, one can drink this young, but the nuances and complexities really don't emerge for at least a decade, especially in the case of a wine such as this. Bravo! Lovely day for the Noble Rot to evolve: sun shining, mist going away and wind around.